Browse our range of babywearing coats and jackets in fleece, sweatshirt and softshell as well as quilted jackets and coats for the cold season. Carry your baby in style and comfort. Stay warm and protected when you are out and about with your baby whatever the weather. Bonding with your baby can’t be easier. Trendy pattern and thought-through functionalities give you value for money well beyond babywearing. At Viva la Mama you‘ll find baby carrier jackets suitable for all seasons. Choose from different materials and styles and start your babywearing journey in comfort. You’ll find in our range light jackets for spring or cooler days in summer as well as warm jackets or coats for fall and winter. An all-weather softshell jacket is ideal for rainy and windy days. We deliver your jacket straight to your doorstep. For our Fleece jackets we choose the best material. That‘s why they are very soft and comfortable to wear. Fleece keeps you and baby warm from spring to fall. On cooler summer mornings or evenings you quickly zip-in the insert for babywearing. Within minutes you are ready for your walk. (Except the kangaroo hoodies AHOI – they are pure mom and baby jackets with integrated pouch for baby). The jackets come with hoodies for mom and baby. Choose your jacket from a range of colors and lining pattern. Sweatshirt material is very comfortable to wear. It keeps you and baby warm when out and about. From spring, cooler days in summer to fall and even on milder winter days you’ll have the right jacket to wear. Comes with easy to zip-in insert for babywearing. Without insert you have a practical and chic sweater jacket. 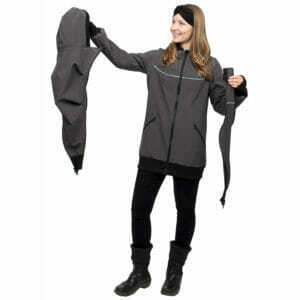 Softshell jackets are very popular with many moms. The material is elastic, breathable and protects from wind and rain. Our softshell has three layers including a fleece layer to keep you and baby warm. As an all-weather jacket our softshell jackets and coats are perfect for most seasons. On very cold days in winter we suggest to wear an extra layer of clothing underneath. The close contact with your baby and the exercise generally keeps you warmer whilst babywearing. Expecting a winter baby brings its own challenge. Protect your baby bump and later your little baby from the winter elements by choosing a quilted jacket or coat. With innovative babywearing inserts to make it easier for babies who don’t like fabric pulled over their heads. We designed the pregnancy and babywearing inserts so that they can be adjusted in width too. This is great for smaller bumps or newborn babies. All our babywearing jackets and coats (except the kangaroo hoodie AHOI) are suitable as maternity jacket or coat. Hidden zippers on both sides or a separate and easy to zip-in insert give you the extra width. 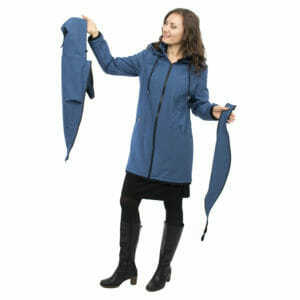 Use one jacket from maternity, whilst babywearing and later as casual jacket. Good value for money for a high quality jacket. 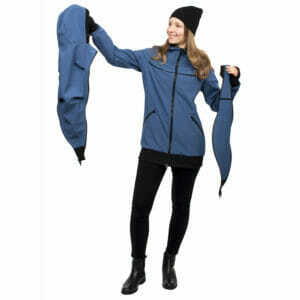 What are 2-in-1, 3-in-1 and 4-in-1 jackets? 2in1 jackets are also known as kangaroo jackets for mom and baby. These are pure baby carrying jackets with a pouch sewn in. This makes babywearing more comfortable for the time when you are carrying your baby. Our jacket AHOI is a typical kangaroo fleece hoodie for babycarrying. Choose from a variety of colors and lining pattern. 3in1 jackets and coats are the majority of our jacket range. You have three functions in one jacket. 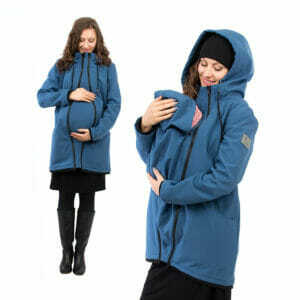 You can wear the jacket already during pregnancy as maternity jacket. After your baby is born you zip-in an insert and can wear the jacket whilst babywearing. Once your baby is older or when you are not babywearing you have a stylish and practical jacket. Perfect for days out with your family. 4in1 jackets and coats are basically the same as the 3in1 jackets with the additional function of being able to carry your baby on your back. That is particularly of benefit when your child gets older and heavier. Or when you are an active outdoor family. Your tired toddler can have a nap whilst being carried on your back. Explore our range of babywearing fleece, sweaters and softshell jackets and coats and buy your favourite jacket today. We deliver straight to your home.